The NRA Instructor Basic Pistol course is what is referred to as a discipline course. You must have completed and passed the NRA Basic Instructor Training (BIT) prior to taking a discipline. Upon completion of this discipline the Instructor candidate will be able to conduct and instruct Phase 2 of the new NRA Basic Pistol course. As of April 04, 2017 the NRA has re-implemented the Instructor Led Training (ILT) for Basic Pistol along with the "blended" learning program for the Basic Pistol Discipline. This has changed some of the pre-requisite requirements for the instructor candidate. As a result of receiving the certification for the Basic Pistol you can instruct either using the ILT based format or the blended learning format. You also will be able to instruct the additonal Simulator based pistol program also, giving you three different courses that the instructor can conduct and in up to seven unique subject content. This will be explained more fully during the class. The instructor candidate must complete the following pre-requisites prior to attending. As an instructor candidate you must have completed the NRA Pre-Course questionnaire, sent to you from our enrollment system. The shooting qualificaiton, which may be waived various criterias enplained in the email attachment we send you, or during the live fire exercises during the course. Instructor candidates will be provided two lesson plans one for the ILT and another for the Blended Learning program by email. A printed version of the ILT version will also be provided at the time of the calss. Role-playing is a major part of an instructor course; therefore, the minimum class size should be at least four candidates, with 10-12 candidates being ideal. Candidates take turns working in teams, actually conducting portions of the course to other candidates who portray basic students. 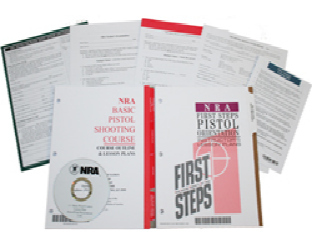 Candidates will be provided with the NRA Trainer’s Guide, appropriate Lesson Plans and Outlines, NRA Trainer’s Examination and NRA discipline specific instructor examination (minimum passing grade is 90%). The NRA Instructor Basic Pistol course teaches the basic knowledge, skills, and attitude for owning and operating a pistol safely. and continued opportunities for skill development. This course price is all inclusive for all course materials, range fees and instructional aids. You will need to bring your own firearm and ammunition (100 rounds) that will be explained in the enrollment document sent to you upon enrollment.